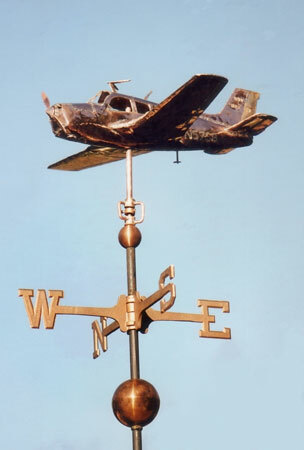 This Beechcraft Bonanza Weather Vane was one of the first custom airplane weathervanes created here at West Coast Weather Vanes. Included in the price is a gold leafed N number and your choice of a turning or stationary propeller. 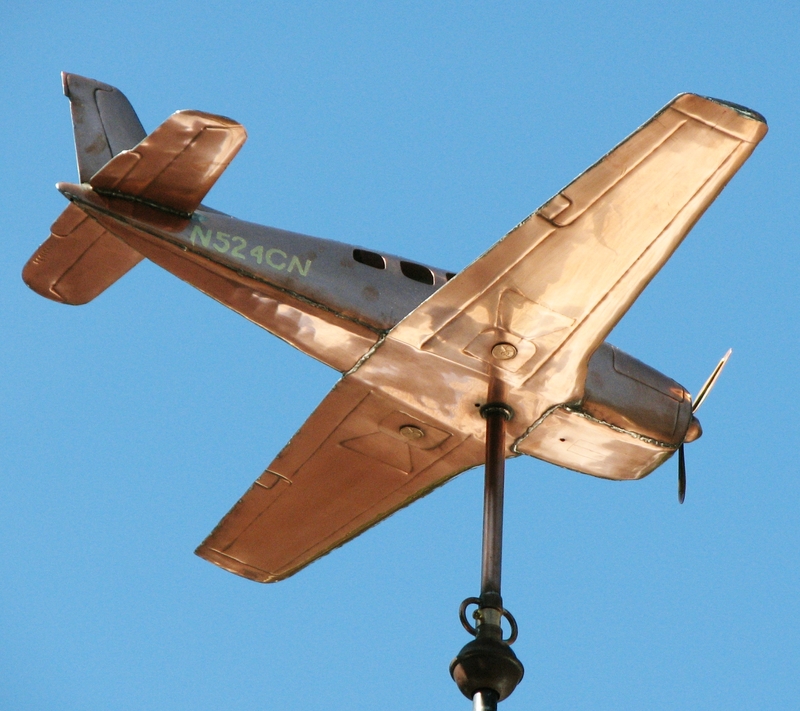 Many of our airplane weathervanes are made as gifts and the always bright gold N number is a special way to personalize it for the recipient. As an option, we can apply gold and/or palladium leaf to match individual trim lines or insignia on the aircraft and can apply optional palladium leaf to the propeller and/or tires. 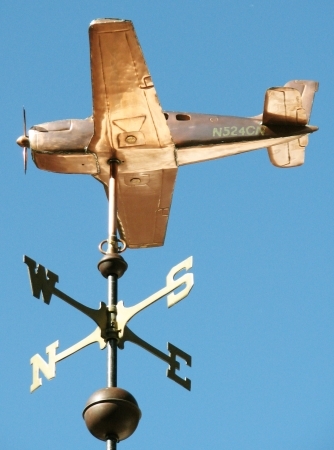 You can also choose to have your airplane weather vane shown with the landing gear up or down and choose between a conventional tail or the V tail variant. We are often able to reduce the design fee for some of our more mechanical weathervane commissions if detailed schematic drawings are available. Also helpful are photos of the actual aircraft we will be representing. If customers can provide us with detailed photos from all angles of the insignia, detailing, interiors, etc., we are then able to make personalized enhancements to their weathervane. Often overlooked when sending photos is detail of the underside of the aircraft. This is an important view when looking up at a weathervane. If actual scaled down models are available, we often find them helpful guides during the construction process. All of our airplane weather vanes and our soaring bird weather vanes come with a standard security device. This is important because in high wind situations the sculpture piece itself could develop lift under the wings causing it to shimmy up the vertical installation rod! The security device allows the weather vane to turn freely in the wind while preventing it from lifting up when winds are high. The Beechcraft Bonanza is an American General Aviation aircraft introduced in 1947 by The Beech Aircraft Corporation of Wichita, Kansas. As of 2010, it is still being produced by Hawker Beechcraft, and has been in continuous production longer than any other airplane in history. More than 17,000 Bonanzas of all variants have been built.